If you are looking to add a premium wireless speaker into your life, the 2015 B&W Zeppelin is the one you seek. Deep, rolling bass coupled with precise control over mid and high frequencies belie even its £500 price tag. 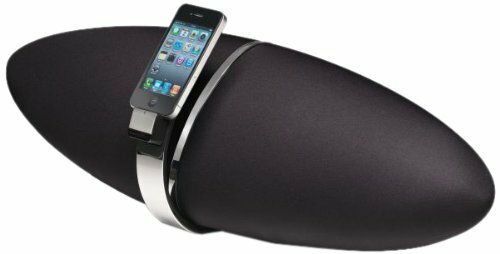 It's been more than four years since Bowers & Wilkins last unleashed a Zeppelin speaker system onto the world - and almost eight since the first one nigh-on created the high-end iPod dock category (remember those?). Now the oval audio behemoth is back and it has never been better. There's no dock of sorts this time around and it has been rebuilt from the ground up, but the most significant change in feature terms is that it's no longer exclusive to Apple device users; B&W has added Bluetooth and Spotify Connect support to partner the brand's long term love of AirPlay. This means that Android phone and tablet owners can make the most of the Zeppelin's talents too, as well as users with Windows Phones. Indeed, the former even get the higher quality Bluetooth aptX support if their phones are compatible – something Bowers & Wilkins has been adding to several devices of late, including the P5 Wireless headphones and T7 portable speaker. And because it has wired internet and Wi-Fi internet connectivity too – for AirPlay lossless and Spotify Connect – it really jams in as many wireless technology options as possible. So all good in the feature stakes, but does the Zeppelin justify its £500 price tag in audio performance? Yes. Yes, it does. In spades. In design terms, the oval shape that is synonymous with the iconic speaker range has been retained, although it seems even more elegant than before. You won't find many competitors with designs as creative as this. The shape is not just a style choice either. B&W claims that it is the best form factor acoustically for a solution that features two 25mm double dome tweeters, fixed suspension transducer drivers, and a 6-inch subwoofer. There are five drive units in total (4x 25 Watts and one at 50 Watts) – each driven by a dedicated class D amplifier. You have to fit them all in somewhere and who wants a large brick taking pride of place in their living room? The elongated ends either side also widen the sound stage dramatically, filling a room as capable as separate stereo speakers. There is also a remarkable amount of bass response given that, while wide, the new Zeppelin has a reasonably small physical footprint. We tested the speaker system with a selection of tracks of high quality (and some less so) and it always presented a fresh, clear listening experience, but with enough grunt that we could actually feel the room gently vibrating to the rolling low-end notes. And Bluetooth aptX or AirPlay playback aside, even when using Spotify Connect and the non-high-resolution streamed tracks on that service, we were very impressed. Having heard tracks from Fink, Hot Chip and The Who (Baba O'Riley, what else?) we were both pleased with how much the music filled the room spatially, and also how clean the mid-range remained. This isn't just a wireless speaker, but a stereo replacement, we feel. If it's this good with lossy music, which it is more likely to be fed on a regular basis, then it isn't just a secondary device, it should take pride of place. That doesn't mean the new Zeppelin isn't capable of high-res audio though. It has a new audiophile standard 192kHz/24bit DAC and an all-new digital signal processor that processes at twice the speed of the last generation. There's also a new dynamic equaliser algorithm, all of which help to enhance even low bitrate tracks. It won't find detail that has been lost in the encoding process, but you might be surprised (as we were) to hear some nuances and elements that aren't usually audible. It is also remarkably easy to set-up – more so than a normal stereo system. You tap the side of the front panel to set it to pair mode, then search for it on your device. Once found and paired, that's it. Dead simple. That's for Bluetooth, while Apple device users get a dedicated Bowers & Wilkins Control application to set-up the AirPlay aspects to ensure lossless transmission. Alternatively, you can hook-up a separate external source through an analogue audio input on the rear. We even had it hooked to a wall-mounted TV, sitting on a cabinet in front and therefore working like a soundbar. It dramatically improved the audio from our set, that's for sure. The rear also sports an Ethernet port for wired internet set-up in case you don't want yet another device competing for wireless bandwidth in your home, but that's essentially it. Everything is kept clean and minimalistic. There's no remote control this time, mainly because whatever device you are using will have all the necessary controls, although there are three touch buttons on the rear that you can use to pause/play or alter the volume. It is further proof, if needed, that the Zeppelin Wireless is designed to simply work and fit into your life without adding extra stress. Indeed, the only time you might notice that it's a big lump of technology is when you take it out of the box and realise that it's a mighty 6.5kgs. Once set-up though, the only thing heavy is the fantastic bass response. That's not to say the new Zeppelin isn't aesthetically pleasing. The sleek lines and iconic shape make it stand-out in any home or office environment, while the simplicity of use ensures it fits into rather than dominates your entertainment needs. However, the proof of the pudding is in the eating, so they say, and in this case its audio performance is full-on, not half-baked. Deep, rolling bass coupled with precise control over mid and high frequencies belie even its £500 price tag. And that's regardless of whether you are listening to Spotify or CD-quality rips you've prepared yourself. If you are looking to add a premium wireless speaker into your life, the 2015 B&W Zeppelin is the one you seek. Just look at it.